Research question: How much kneading is needed to produce a light, airy loaf of bread? Before baking, bread dough is mixed, kneaded, and left to rise to produce a light, airy loaf. Kneading serves two purposes: to help develop gluten in the flour and to distribute yeast cells throughout the dough. Gluten is a flexible film that is formed when glutenin and gliadin proteins link together with hydrogen and ionic bonds during kneading. Kneading dough by hand is a labour intensive task. I aim to find the minimum amount of time required to knead dough while producing a light loaf, for both white flour and whole wheat flour. 1 Joseph Amendola and Nicole Rees, Understanding Baking: The Art and Science of Baking, 3rd ed. (John Wiley and Sons, inc., New Jersey), p 162 -163. 3 Peter Barham, The Science of Cooking (Springer-Verlag, Berlin, 2001), p114. Table 1. Summary of key variables in this experiment. Independent variable Kneading time of the dough. Key controlled variables Bread recipe (particularly sugar,yeast, and flour amounts). Rising time and baking time. are constant in each trial. Sugar is the fuel for the yeast and will influence the amount of gas that the yeast produce. 820 g flour (white or whole wheat depending on the trial). 3. Begin kneading the dough. Remove an approximately 100 g portion at regular time intervals. Shape into a ball, contacting the dough as little as possible. Place on an oiled cookie sheet. 4. Let the dough rise uncovered for 60 minutes in an oven preheated to 170 OF (77¬∞C). Oven was turned off with 37 minutes of rising time remaining. 5. Remove dough from oven and preheat oven to 350 OF. Bake for 20 minutes. Put the tray with the variable knead times on the top rack and the control buns on the middle rack. Remove from oven and allow to cool before touching the buns. 6. Weigh each bun, then wrap in cling film. Submerge each bun in water to measure the volume of water displaced. 7. Replace the flour in step 1 with whole wheat. Continue with steps 2 – 6. 8. Repeat steps 1-7 twice, for a total of three trials of white flour and three trials of whole wheat. The control buns had an average density of 0.342 g/mL, and all the control buns were within 1.7% of the average value (see table 2). This suggests that the location of the buns in the oven during rising and baking has a negligible impact on the final density. Figure 1. Plot of all the densities determined for three trials of white flour buns and three trials of whole wheat buns. As the kneading time increases for both the white flour and the whole wheat dough the density of the resulting buns generally decreases (see figure 1). The whole wheat buns are considerably more dense than the white flour buns. The densities of both types of buns have the general shape of an exponential decay. The rate of decay is slower in the whole wheat buns compared to the white flour buns. This suggests that gluten, a protein found in wheat, takes longer to develop in whole wheat flour when kneaded, compared to white flour. In chemical reactions, the initial rate of a reaction can be determined by fitting the linear portion of a measurable observable versus time. 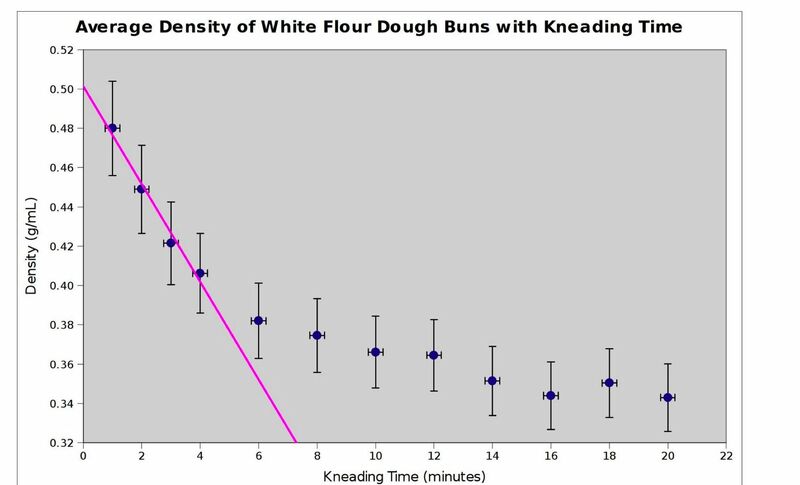 In this experiment, the decrease in density with kneading time can be used to compare how quickly gluten develops in both white and whole wheat flour. Figure 2. Average of the calculated densities of three trials of white flour buns. The pink line indicates the linear regression of the first four data points (deemed linear). The equation of this line of best fit is y = –0.0249 x ± 0.501, with an R-squared of 0.9791. Figure 3. Average of the calculated densities of three trials of whole wheat buns. The pink line indicates the linear regression of the first five data points (deemed to linear). The equation of this line of best fit is y = -0.0172 x ± 0.600, with an R-squared of 0.9944.
whole wheat dough, respectively. If the goal is the lightest (least dense) buns possible, small returns may be seen when the dough is kneaded for longer than the duration of my experiment. The actual decreases in density, however, become unreliably small after a while. 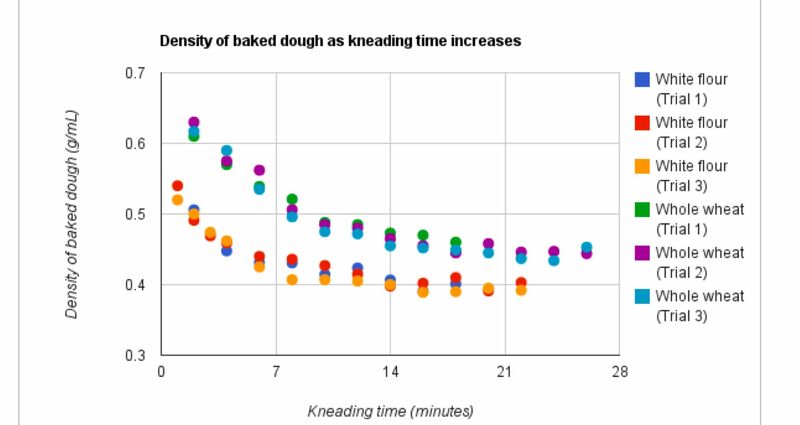 In the six trials conducted for this experiment, kneading the bread longer continued to provide small decreases in density until an average of 8.7 minutes for white flour and 17.3 minutes for whole wheat flour (see table 3). Table 3. First time at which the bun density decreased bv less than 0.01 a/mL. Gluten develops more quickly in white flour compared to whole wheat. As shown in figure 2, the density of the white flour was initially decreasing at a rate of 0.0249 g/(mL min) (grams per milliliter per minute). For whole wheat buns (figure 3), the density decreased more slowly, at a rate of 0.0172 g/(mL min). This is approximately % the rate of the white flour. As the gluten is developed, the rate of the reaction slows and the elasticity of the dough increases. This is why the density of the buns decreases more slowly as the kneading proceeds. 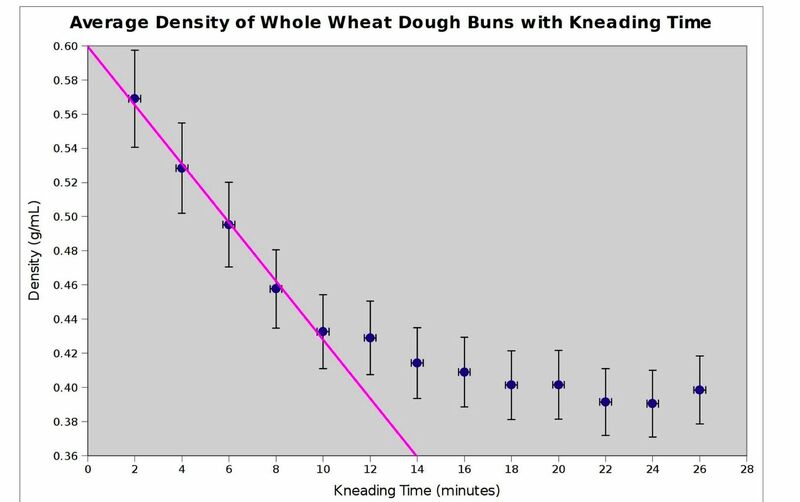 The density decrease deviates from the linear regression after 4 minutes for white flour and 10 minutes of kneading time for whole wheat. Kneading for an infinite amount of time is inefficient and unnecessary. Significant improvements in bun density were no longer apparent after 8.7 minutes and 17.3 minutes for the white and whole wheat buns, respectively. Conclusion: When trying to make light and fluffy bread kneading 4 to 9 minutes for white flour and 10 to 17 minutes for whole wheat flour is a good compromise between effort and impact of kneading. My mother performed all the kneading of the dough in these trials, so that the technique was as reproducible as possible. My dad ate all the buns (after testing) so that they wouldn’t go to waste. See how Milo started to plan his project in the First Installment! Wendy Topic is a science teacher at Glenlyon Norfolk School. Follow this regular VIRSF Newsletter feature as Wendy describes Milo’s journey through the whole process of doing a Science Fair project.